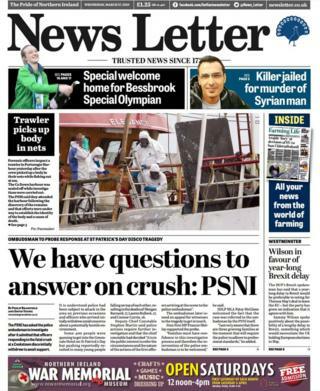 The Police Ombudsman's investigation of the Cookstown hotel deaths response, as well as the sentencing of a man who killed a Syrian in Belfast, make the front pages. It emerged on Tuesday that the initial police response to the incident in County Tyrone is to be examined. The first officers who arrived at the scene of the tragedy withdrew to await support, it has been reported. The crush took the lives of Morgan Barnard, Lauren Bullock and Connor Currie. In an interview with the News Letter, Sinn Féin MP Francie Molloy said he supported the probe. He told the newspaper that "families must have confidence in this investigative process and therefore the intervention of the police ombudsman is to be welcomed." The Belfast Telegraph leads with the sentencing of Callin Wilson, a 20-year-old man who will spend nine years in prison for killing a Syrian man in Belfast. Wilson, of no fixed abode, was 18 when he murdered Hazem Ahmed Ghreir, 30, in the city centre in 2017. Mr Ghreir was stabbed in the heart after approaching Wilson who appeared to be tampering with a bicycle, Belfast Crown Court heard. Sentencing Wilson, who had pleaded guilty to the murder in January, Judge Smyth said Mr Ghreir had "sought to intervene" in a "public-spirited way". The judge told Laganside Court on Tuesday that Wilson had shown signs of a serious mental disorder. 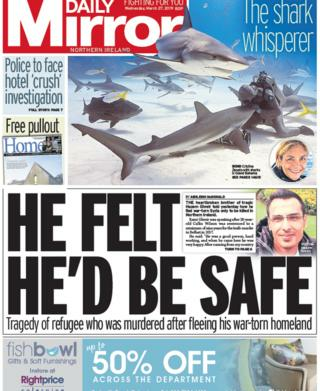 The Daily Mirror, which also carries the story on its front page, quotes Mr Ghreir's brother who said that he missed him every day. "He was a good person, hard working, and when he came here he was very happy," said Rhami Ghreir, who spoke after the sentencing. The Belfast Telegraph has the story about a Co Down woman who is considering travelling to mainland UK for her MOT because of lengthy waiting times. Samantha Gallagher, from Comber, has been told she has to wait a month to get her car checked before her certificate expires. She told the newspaper that the MOT system is a "farce" and that last year she was able to get an appointment within two weeks. The Driver and Vehicle Agency responded, stating that customers should book their vehicle test as soon as they get a reminder notice. News of another reduction of the cordon around the fire-ravaged Primark building in Belfast city centre also makes the newspapers. The Irish News interviews Kathleen McGovern of Abacus Beads. She told the newspaper of her elation at being able to move back seven months on. The build-up to the new series of the BBC's Line of Duty makes headlines in the Daily Mirror. Adrian Dunbar, who plays the no-nonsense police boss Ted Hastings, said that his character is the "fella" to sort Brexit. Mr Dunbar said that Ted would "make very short work" of getting the UK out of Europe. "He'd get a few of those guys across the table - Barnier and Tusk and a few of those guys - and put them on a bit of an interrogation," he said. "Then, he'd pull out a few of the eccentrics, like Rees-Mogg and others, and he'd give them an even bigger grilling." Anthony 'Bronco' McLoughlin, the Irish stuntman who appeared in numerous hit films including Indiana Jones and the Temple of Doom, Star Wars and Rambo II, as well the acclaimed sitcom Father Ted, has died, reports the Irish News. McLoughlin, who was from Ashford, Co. Wicklow, earned his nickname after he left school aged 16 to work as a cattle rancher in Australia. He played many roles in movies, including playing a stormtrooper in Star Wars in 1977, and working as a stuntman on Richard Donner's Superman.